For the past 20 years, Terry Cashman, known as "The Balladeer of Baseball," has composed and recorded more than five dozen songs recalling the glory of our National Pastime and the players we idolize. But the lack of forthrightness exhibited by numerous free agents has given Cashman cause to reflect. The result is a very funny song about baseball players and money. Cashman's The Money Doesn't Matter To Me is an irreverent, country-flavored spoof of players, particularly Mike Hampton, Manny Ramirez and Alex Rodriguez , who left their "old teams" for new opportunities. Cashman points out that these free agents were paid mega-millions to go to their new teams, yet find it impossible to acknowledge that the money had any influence on their decisions. Hampton, for example, claimed he doesn't care for the schools in New York and doesn't like cold weather . . . but Denver, Colorado? Ramirez stated he "had" to play with Boston Red Sox pitcher Pedro Martinez to meet his goal of beating the Yankees. And A-Rod alleged that he doesn't care about "stats," but happened to leave Seattle, where Safeco Park has proven unfriendly to hitters, for the friendly confines of Texas Stadium in Arlington, TX. All three, coincidently, went to the highest bidder, notes Cashman. 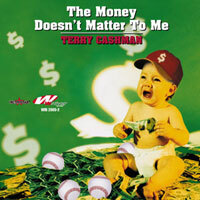 The Money Doesn't Matter To Me is a new CD compilation featuring nine other Terry Cashman baseball songs, most of which have not had significant exposure to the public. "We selected cuts which we feel are musically compatible with 'The Money Doesn't Matter to Me,'" stated Cashman, "and which also make for a good listening experience. Hopefully, our new song will introduce a new audience to my music while providing my fans with an exciting and entertaining new record for their collections." Terry Cashman, known as "The Balladeer of Baseball," who has written, recorded and performed more than 40 songs about the National Pastime over the past 20 years. A former minor league baseball player who was raised in the Washington Heights section of New York City, Cashman has been a top recording artist, record industry executive, composer and producer who began in the business more than 40 years ago.